Concealer. . . One of the most used makeup products used in the beauty industry. Many people are always on a hunt for concealer to cover up imperfections like breakouts, discolored skin, and the most popular under eye circles. Like many, I am always on the hunt for a concealer that will cover my imperfections like under the eye especially during allergy season. It never fails that when allergy season comes around my under eye becomes puffy, red and dark. In addition to the issues listed my fine lines underneath my eyes became more visible. So, with that said I need a concealer that will meet the needs listed. I currently own many concealers that work very well for concealing imperfections like MAC cosmetics Studio finish, Smashbox camera ready concealer and Stila perfecting concealer, however none of them are like the concealer I am going to share with you today. 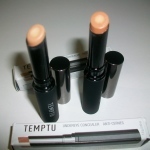 The concealer I will be talking about is the TEMPTU Under Eye Concealer that is a perfect companion for those of you that already use the Temptu AIRbrush Makeup System. The Temptu under eye concealer is unique in it one way compared to the concealers I already own. How? Well this concealer conceals and also has some amazing skincare combined with it. What is it? What's in it? Cucumber and Chamomile Extracts: Soothing, cooling and anti-inflammatory agents. Of course apply your favorite skincare on freshly cleanse skin for before you apply any foundation or concealer. Apply the Temptu Under eye concealer and use your ring finger to pat and roll the concealer on for a smooth application. Finally apply your Temptu Airbrush foundation for a flawless finish to your complexion. Then Set with Temptu Retouch Translucent powder. My thoughts on this concealer? Well, I have been using this concealer for the past 3 weeks nows and here are my findings: During the days when my allergies were bad to the point my eyes were puffy I did notice that the Temptu under eye concealer did reduce the puffiness and redness. That was a plus to me because my eyes would look terrible with my regular concealer. The coverage was a bit light for me. If you are used to using MAC's studio finish concealer you know that you can receive full coverage from that concealer, right? With the Temptu concealer I felt it gave me a light to medium coverage, so in turn I had to apply a bit more than normal to achieve the same coverage I get from my MAC or smashbox concealer. As far as seeing any reduction in fine lines and wrinkles I don't think 3 weeks was enough time for me to see that benefit. Just being honest. The color match was pretty good! The tan worked great for me and the dark color I had would be a great companion if I got more sun. If that were to happened I could mix the too together to get the perfect match for my summer skin tone. As far as the wearability, I was happy to say that the product did not get cakey or crease on me throughout the day. In turn my eyes look bright and refreshed. Overall, I have to say that the TEMPTU Under Eye Concealer is priced on the high end of concealer, $28, and if you have the concerns with fines lines, puffiness, and discoloration definitely give it a try. However, if you are needing a full coverage concealer this may not be for you and you may just need to opt for a full coverage concealer and add on your favorite eye cream for the extra skincare benefit. This Concealer can be foundation at Sephora.com ., Temptu.com and QVC.com . I was shocked when I heard that QVC carried the Temptu airbrush system! I thought that was great because now if anyone wanted to give it a try without having to shelling all of your money in one big payment QVC offers easy pays on the system. Here is my tutorial on how to apply and use the Temptu airbrush foundation. I thought doing this would be a challenge, but it was super easy and the best part was not having to dirty up my foundation brush and blush brushes to apply them product on. If you have been thinking about airbrush makeup definitely check out this tutorial featuring Temptu’s Airbrush Makeup System. I am in love with airbrush makeup now. The product just feel so light on the skin and the longevity of the product is wonderful especially if you live in hot humid climates like here in Texas. Airbrush makeup as become very popular over the past decade due to its flawless results airbrushing gives to many makeup artist’s clients whether if the client is a celebrity or an everyday woman getting ready for whatever that special occasion maybe. Airbrush makeup seems to gives such a immaculate and luminous finish to the skin without feeling heavy or cakey, as a result, becoming the tool of the trade for many makeup artists around the world. Recently, Airbrush makeup has become such a buzz in the beauty industry that now many brands offer a airbrush system to women and men on the consumer side of the beauty industry now. Airbrush makeup at a consumer level? Yes, that’s right! Anyone with the desire to have airbrush makeup can now own their personal airbrush makeup system to their personal makeup collection if desired. The Airbrush makeup system I will be sharing with you all today is by Temptu. Who or What is Temptu? TEMPTU became a pioneer in AIRbrush makeup, and one of the first cosmetic houses to introduce AIRbrush application foundation back in 1996. In 2002, TEMPTU introduced its groundbreaking silicone-based formula foundation that delivered an unparalleled flawless finish and became an instant classic with makeup and beauty pros. Soon, TEMPTU was launched into beauty stardom as the go-to brand for camera-ready, flawless skin. Sharing an intimate relationship with the makeup industry’s top artists, TEMPTU’s work and products can be found gracing the faces and bodies of top stars and models in feature films, television, music, and fashion. Gathering the feedback of their closest artisans, TEMPTU has been able to develop the leading professional products on the market today, making them the industry’s gold standard when it comes to skin perfection. Now available to anyone in search of skin-perfecting makeup application, TEMPTU’s groundbreaking TEMPTU® AIRbrush Makeup System is a necessity for anyone who wants truly professional quality makeup within their reach. Today, TEMPTU stands at the apex of where beauty meets technology. They rely on their professional artists to inform the quality of every product they create, and they strive for universality to serve the needs of every beauty out there. It’s these pretty practices that help TEMPTU bring their “PERFECT, ENHANCE and ADORN” makeup mantra to life. Follow their three get-gorgeous tiers, and you’ll be a TEMPTU poster girl in no time. I remember last year when this product came out and I was dying to give it a try, but my local Sephora did not carry one at that, so I decided to hold off on it. I have always wanted to try an airbrush system just in order to see what the difference was between airbrush makeup and regular foundation. Until recently. I was kindly contacted by Temptu to complete a review of their Temptu Airbrush makeup system and you know me being a makeup enthusiast I was all over it and agreed to try it out! I mainly want to calm my curiosity and to also share it with those of you they are thinking about airbrush makeup too. The Face Kit contains a TEMPTU AIRbrush Makeup System plus 2 full-size AIR pod™ Foundation pods, 1 full-size AIR pod™ Blush, and 1 full-size AIR pod™ Highlighter. The blush and highlighter pods contain approximately 2 months of makeup, and the foundation pods contain 1 month of makeup each, work with all skin types, and are suitable for all skin tones. They’re dermatologist-approved, oil-free, and hypoallergenic — perfect for those with sensitive skin. The price of the kit is reg. $345 sale $310. As far as picking out my foundation shade it was kind of a struggle because it is kind of hard to match your shade online. However by the luck of the stars I ended up picking a a wonderful match. The shade that I wear in the Temptu Airpod makeup is 009 Golden (My shade in MAC foundation is NC42) The foundation is available in only 12 shades so, if you are not too sure what to pick out I was totally recommend going to your local Sephora that offers the Temptu System and get color matched. On the other hand, I think it would be a great idea if Temptu offered a free foundation sample just for the sake of color matching. In addition to the foundations they also offer bronzers, highlighter, and blushes. What I found helpful is not only did this kit come with the system and makeup, but it also included a very easy how to guide on the system and for those of us that are visual learners the kit also contained a how to DVD. The DVD was less then 10 minutes long which made it very easy for me to get started asap. Now, you are probably wondering is it the Temptu Airbrush makeup system easy to use? Absolutely! Almost too easy too use. After reading and watching the DVD it was very easy for me to put the system together without breaking it. (smile, I am heavy handed) When it came to applying the foundation, I liked the fact that you can adjust your coverage of your foundation through the compressor or the airbrush pen. Super easy! The flow of the makeup is smooth and as a result, you end of with a light yet flawless finish to you makeup! I could not believe how easy it was to use this system and how little time it took me to apply this makeup. Literally it took me less than 3 minutes to apply the foundation. It took me a little while to get used to the air slightly blowing in my face, but after that I was free sailing for sure. You can achieve a light and sheer coverage or a med to full coverage with the same foundation. I think that is great depending on your lifestyle and how you would use this personally. I also liked the fact that I did not have use a foundation brush, sponge or hand to apply the foundation either. The best part is that my clothes or hairline did not get dirty from applying the makeup too! So, That was fabulous!! Now if you are an makeup artist this would make a great system to use with your clients however, the downside is that you are unable to custom blend your foundations with this system. However, Temptu does offer a Pro version for makeup artists. If you are curious about the pro system visit Temptupro.com. Overall,the Temptu Airbrush Makeup system is very easy to use. My thoughts? This is a luxury item like I mention before this system will cost you from $280 and up depending on the extras you add. It is expensive, but I believe it is on average with other consumer airbrush systems like Luminess air and others on the beauty market. This system is easy to travel with because of it size and even the airpod foundations are airport friendly as well. So, for those that have been looking into using airbrush system for the personal use I would totally recommend using the Temptu airbrush makeup system. I really enjoyed using it and can not wait to show you all how to use it in a tutorial which is coming soon. In the meantime enjoy my video above about the system and how it works.